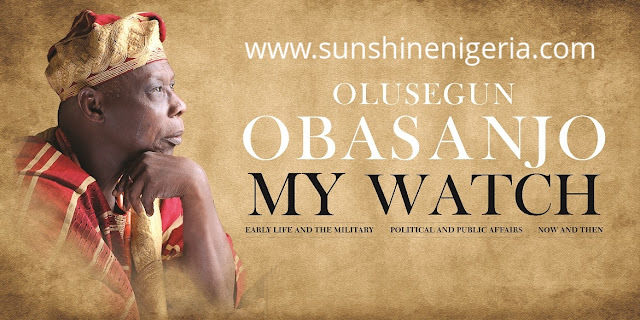 You can now get an ORIGINAL copy of the book, "MY WATCH" by Olusegun Obasanjo (3 Volumes) for just ₦10,000. 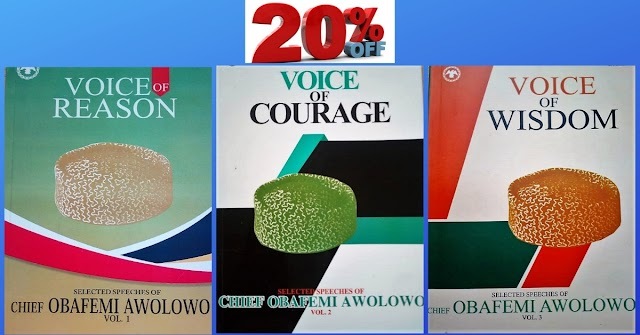 Many people were shocked to find that the paperback copy of Olusegun Obasanjo's Book books "MY WATCH" cost ₦15,000 while the Hardback copy cost ₦25,000. Many reports, emails and comments received by us suggest that the price of the book is too high, and that the price should be review downward to afford them opportunity to grab a copy of the book and also encourage more people to read. We have since spoken with the publisher of the book about the complains of our numerous customers and they have allowed us to run a week promotional period for our customers to allow them to buy the paperback copy of the book for just ₦10,000, a whooping less ₦5,000 of the cover price of ₦15,000 and to also buy the hardcover copy for just ₦15,000, a whooping less ₦10,000 of the cover price of ₦25,000 and you also get another free book of Chief Olusegun Obasanjo as a compliment when you buy a hardback copy of My Watch (preferred right?). There can't be a better chance for you to get a copy of this book: My Watch. This is a one time opportunity for you to own an ORIGINAL copy of this great book and at the cheapest prices ever. Please don't expect that the prices will ever come down again because the prices will surely return to their original cover prices once the promotional period is over. So grab your copy now while offer last. SHUN PIRACY, BUY ORIGINAL BOOKS. Please don't buy the pirated copies that has been in circulation especially across Lagos, Portharcourt and Abuja. They may be cheaper (some even cost higher) but they are not the complete version of the book and they are poorly printed locally. Moreso, it is a crime for both the seller and the buyer of pirated books. This is more reason why we at Sunshine Bookseller is giving you another opportunity to buy the original copy of My Watch and at a very cheaper price. Delivery is free within Ibadan and Lagos only and you can also pay on delivery if you are in Lagos or Ibadan. Just text your Name, Delivery address, Cover type (Paperback or Hardback), Best time to delivery to 08028708577 and someone will be there to deliver to you then you can Pay on Delivery. Delivery to Abuja, Port Harcourt, Umuahia, Minna, Ilorin, Eboyi, Onitsha, Aba, Enugu, Onisha, Owerri, Nasarawa, Abakaliki, Ilorin, Port-Harcourt, Cross River and Balyesa will cost just N1,200 and delivery will be via Peace Mass Transportation Courier Service. Delivery to Benin City and Warri will also cost you just N1,200 and delivery will be via Eagle Line Transportation. Delivery to Kano, Kastina, Sokoto, Jos, Kaduna, Niger will cost just N2,000 and delivery will be via public transport. The driver's details will be sent to you and you will also speak with the driver at the point of sending to arrange how best to meet at his destination and collect book(s). Deliver to other location can be arranged with us for the best option. Just call 08028708577. “My Watch”, which runs in three volumes and at over 1,500 pages, will leave readers confounded as to whether to classify it as a memoir, a historical document, or both. There are hundreds of pages of documents and private correspondences between the author and many of the leading political figures of our time. Clearly, these documents were included to validate and refute claims. However, their true value is in the substance they provide to serious students of contemporary Nigerian political science, and in deed, African history. Scholars would pore over these notes for decades to properly position the actions and in-actions of our various political rulers. This book is very important because it may motivate the various political actors who have been taciturn in the inner workings of government to defend their integrity, explain their actions, and provide context. So what kind of man do we find in those pages of the book? Probably the same Obasanjo you already know. A charming storyteller with a lot of humour and, in the same breathe, a dogged fighter who will uphold his convictions irrespective of negative or positive sentiment. How do you make enmity with a man who believes he is on watch for God over his and God’s people? The author, in his watchman role, does not fail to name and shame those he considers to have worked against the progress of Nigeria. No one is beyond reproach. No character too big to be cast in what he sees to be their true image, which, in most cases, are contemptible. Little wonder the few reverberating earthquakes after this book is in public circulation, one of which was the ₦20billion libel lawsuit by PDP chieftain, Buruji Kashamu, asking the court to stop the distribution of the book because of some things Obasanjo wrote about him in the book. In the book, Obasanjo described Buruji as a fugitive wanted in the US. Some personalities who have presented themselves as leaders and reformists will have to present counter-evidence to defend their reputation: Abubakar Atiku, Bola Tinubu, Tony Anenih, Nasir El Rufai, and many others. In the book, their characters are presented as defective as their personas are large. President Obasanjo described Vice President Abubakar Atiku as a “blatant and shameless liar”. Nasir El Rufai is described as “a brilliant man, economical with truth”. He was not much kinder to some Yoruba chieftains who he described as preferring rather to be “rulers in hell, if they cannot be rulers in heaven”. He described Chief Bola Tinubu as “definitely one of the worst cases” in terms of corruption. He is much kinder to General Mohammadu Buhari who he concludes “would not be a good economic manager” though he would be “a strong, almost inflexible, courageous and firm leader”. What most readers will enjoy about this book is that, true to his character, President Obasanjo did not shy away from addressing any of the more public episodes in his long public career. Like a good trial lawyer, he weaves a good narrative that absolves him of any blame while providing evidence to show where the blames should go. For the benefit of Nigerians and posterity, those the author has accused of wrongdoing should provide rebuttals supported with evidence. This anticipated exchange will help Nigerians connect the dots, see the true picture of what has transpired, and learn whatever lessons there may be from these earlier mistakes. It is, however, instructive, that the more personal, family scandals such as the allegations made by his first wife or daughter, are dismissed as personal issues that are being handled within the family. The “Third Term” saga, which many would consider the major dent to Obasanjo’s global image as a leader with impeccable democratic credentials, is addressed in the book as well. The author presents annotated evidence to show that he had no desire to extend his tenure; rather, that it was the “monumental mischief” of his detractors and their co-travellers in the media that turned an effort at constitutional reform into a myopic argument about tenure elongation. He provides documentary evidence where those who should know (Senators Hambagda, Ibrahim Mantu and Florence Ita Giwa) exonerated him from such an agenda. He, however, accuses Vice President Atiku Abubakar as the one “who was behind the whole episode of turning wholesome constitutional amendment efforts of the National Assembly to a futile exercise and as a means of riding on its ashes to be a Nigerian President”. So is President Obasanjo a saint or a sinner? Readers of the book will have to decide for themselves. However, one thing is for sure, the author is charming and his arguments and documentary evidence can be the “burning platform” for Nigerians to dig deeper and demand more answers. So this question may be irrelevant. What is therefore important is that he has written a book from his perspective and he has not pulled any punches. How great it would be for those who he has indicted in this book to provide their own version of events and present documented evidence to refute his conclusions. It is in the expected exchange that students of Nigerian history can learn what transpired and transpires in those corridors of power. So what is his legacy? I suspect that as one of the most prominent leaders in Nigeria’s modern history, President Obasanjo’s accomplishments and failures will be debated and researched for decades to come and, as is to be expected of this type of leadership, the divergent views will continue for some time. However, one thing that most people will agree on is that President Olusegun Obasanjo brought energy, passion, and vision to the various roles he has held in Nigeria over the last 50 years. Being human, he had his virtues and foibles that played out on our public stage. However, the results of his reforms will be remembered as some of the flashes of brilliance in a nation that has not enjoyed so many of such; yet, the failure to entrench them will also be blamed as some of his failings as well. In all, and probably most importantly, we must be thankful to President Olusegun Obasanjo for the discipline and commitment it took to put this history on paper. At least, we now have one side of the story. And that side is vicious enough that it should prompt a response from many quarters. SHARE THIS WITH OTHERS USING THE SOCIAL MEDIA SHARING BUTTONS BY THE SIDE OR BELOW. i wish for enjoyment, for the reason that this this website conations in fact nice funny data too. simply how so much time I had spent for this information! Pretty nice post. I simply stumbled upon your blog and wished to mention that I've really enjoyed browsing your blog posts. In any case I will be subscribing in your feed and I am hoping you write again very soon! Thank you for any other informative web site. Where else may just I am getting that kind of info written in such an ideal manner? I've a project that I am just now running on, and I've been on the glance out for such info. Hi, I do think this is an excellent blog. I stumbledupon it ;) I'm going to return once again since i have bookmarked it.